Dapur Hosting Review 2019: Is Dapur Hosting a Good Hosting? If you’re looking for extremely cheap hosting solutions, Dapur Hosting is tough to beat with their bargain prices that somehow still come with a number of great features. They mostly operate out of Indonesia, though they also offer web hosting in the United States. Dapur Hosting is one of the few hosting companies based out of Indonesia that also offers customers the use of servers located in the United States. They seem fairly new to the industry, but have already managed to expand their customer base to include the United States, Vietnam, Turkey, and Colombia. They provide a service that’s accessible both because of their affordability and the contemporary nature of their website and software. Their portfolio of services includes a number of shared hosting, reseller hosting, and dedicated server packages. Note, however, that while they offer domain registration and SSL certificates, these are not included as a standard part of their packages — not even with their Premium shared hosting plans. Xeon Intel: They boast the latest Intel Xeon processors and Supermicro servers for not only their dedicated servers, but also their shared hosting services. CloudLinux OS and LiteSpeed Web Server: This combination is an extremely effective duo that improves hosting performance and is deployed on all of Dapur Hosting’s shared server solutions. Multi-domain hosting for most packages: Unlike a few web hosts that will limit you to one or two domains for most of their packages, Dapur Hosting has chosen the opposite route by offering multiple domain hosting with almost all of their shared hosting packages. There is no Windows option for shared servers, however, so users who need Microsoft-specific features such as MSSQL will be disappointed. Dapur Hosting offers a range of web hosting and reseller hosting services, dedicated servers, and email hosting. Their prices are extremely affordable and they’ve got plans suitable for budgets of all sizes — though the caveat is that you’ll have to pay extra in the domain registration and SSL certificate department. All plans are billed on a minimum one-year contract. Generously, they not only provide a seven-day free trial but also a 30-day money back guarantee with their shared hosting services. They do provide migration services but these are priced individually. Prices are the same for U.S. and Indonesian-based services, which was a nice bonus. Dapur Hosting offers 24/7 customer support with all of their services. The technical support is not always the best or the quickest to respond and the level of English you can expect varies considerably. They don’t even have a knowledge base or FAQ for you to self-diagnose any hosting issues, sadly. Their support channels are also rather limited: you can only reach their support staff via an Indonesian telephone hotline, email, or the contact form on their website. There’s no ticket system or live chat available. If you want a website hosted on U.S. servers, the prices offered by Dapur will be near impossible to beat. However, this comes at the expense of quality customer support. 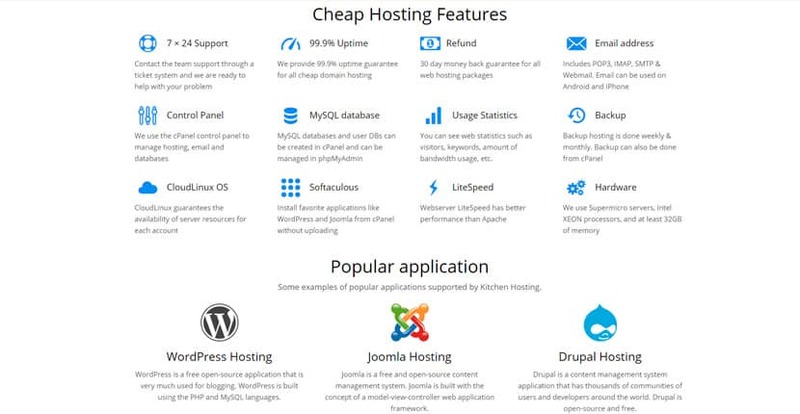 Wondering how Dapur Hosting stacks up against other Web Hosting companies? Enter any other Web Hosting company and we will give you a side-by-side comparison.